They are not planning on replacing the 2006 EIS study, this study is only for the segment south of the Martinsville Bypass, that is what is meant by "within its study limits". But likely any other segment built would have this same process redone again. At this point the original ALC is going to eventually get redone one piece at a time. That's proven by this leg of the project. There are western alignments that are not far from US-220 and they obviously could be tied into the ALC. One of them even follows the existing US-220 closely and may be a freeway upgrade of that. I could see that, but I still believe a western alignment would be better. But that's a different subject - this is about the Martinsville Southern Connector leg of the project. Stop drinking the Kool-Aid. Nothing such is being proved, there simply is a desire for early action and some flexibility about that segment. There is no evidence that the state or the municipalities don't continue to support the ALC. They are not going to conduct a series of EIS studies. There is no evidence that the state or the municipalities don't continue to support the ALC. And there's no evidence that the state or the municipalities do continue (as of 2019) to support the ALC. Interests could have changed. We'll have to see when the preferred alternative is selected in a few months. They are not going to conduct a series of EIS studies. That's exactly what they're doing here! Look at the VDOT I-73 webpage, last modified: July, 2018, nothing has changed as to the ALC. The fact that they haven't passed resolutions changing their decision shows that it hasn't changed. Let's wait until the Preferred Alternative is chosen, and more input is given by the localities. Correct, and as other segments are proposed, an EIS will be completed on those. A bill to earmark funding for the proposed Interstate 73 came to a halt in the General Assembly on Wednesday. Interstate 73 would create an avenue for high-speed travel between Roanoke and the North Carolina line south of Martinsville. It was proposed more than two decades ago, but the $6 billion project has long been stalled because of funding issues. The bill from Sen. Bill Stanley, R-Franklin, would’ve put the interstate next in line for funding that’s currently being allocated to U.S. 58. When the money was available, I-73 would have received about $40 million a year. The transportation subcommittee of the House Appropriations Committee voted not to advance SB 1014 on a 5-0 vote, but the chairman of the committee, Del. Chris Stolle, R-Virginia Beach, said the legislation could be revived Friday at the full Transportation Committee. The bill passed the Senate on a bipartisan vote of 28-11. The bill has been introduced in previous General Assembly sessions. The CTB had this presentation today, and it provided more clarity as to what they are doing. This a special case, among the first usages of the OFD. A way to expedite and advance single projects thru the EIS process. They didn't use the word "pilot" but that is about what this is, in addition to meeting a need to advance a particular project that VDOT and the Salem CTB member wants to prioritize and advance. So this is no predictor of what may happen on the rest of VA I-73. CTB discussion raised some question about the efficacy of the OFD, namely the issue of compressing what normally takes 4 or 5 years into 24 months, also the issue of obtaining sufficient public involvement in the shortened time frame. This is bound to raise controversy about this process, but it will be interesting to see what happens, or if it is possible to work this process successfully. And again it doesn't mean that OFD will be utilized on any of the rest of the I-73 corridor. Issued on August 15, 2017, Executive Order (EO) 13807: Establishing Discipline and Accountability in the Environmental Review and Permitting Process for Infrastructure Projects requires Federal agencies to process environmental reviews and authorization decisions for “major infrastructure projects” as One Federal Decision (OFD). The EO sets a government-wide goal of reducing the average time to complete required environmental reviews and authorization decisions for major infrastructure projects to not more than two years from publication of a notice of intent to prepare an environmental impact statement (EIS) to issuance of a record of decision (ROD) prepared under the National Environmental Policy Act (NEPA). The EO also requires all Federal authorization decisions for the construction of these projects to be completed within 90 days of the issuance of a ROD. Revision to some of the western alignments posted to the Martinsville Southern Connector website. Notice the differences on the southern end. Haven't seen anything regarding the eastern alternatives. Nothing about this project at today's CTB Workshop. Last workshop discussed in Post #506. Wonder if that Red Route is a freeway upgrade of the existing highway. I noticed that on the project website recently. Notice in the bottom right corner it says "March 2019". And the alignment is different than the original slightly, at least the southern tie in near the state line. It is. This is the proposed typical section for any upgrades to existing highway to interstate standards. It would be within a 188 foot right of way. Likely though, this option would not be selected, but rather an eastern or western option. It was likely included the EIS to provide a basis for the other alternatives, and for comparison purposes. The Draft EIS and preferred alternative will be completed by the end of this year, as per the schedule, and we will know then what option they are looking to build, along with likely cost estimates, more detailed designs, etc. Interesting that they modified the southern end. I like it though, but I wouldn't pick option E. Too many business in that section of the road, and probably more expensive. I'd go for Option A or C.
"VDOT, in coordination with the Federal Highway Administration, the U.S. Army Corps of Engineers, the U.S. Environmental Protection Agency, and other agencies, has identified the alternatives that will be advanced through the study." Sounds like all of the eastern alternatives are eliminated, therefore why they aren't being listed on the revised map. I might be wrong, but take it with a grain of salt. and the following picture listed right below it, with a March 2019 stamp on it. It does indeed look as the eastern alternatives have been eliminated. It makes sense, I really don't see the benefits of an eastern alignment for this particular project. I could be wrong, but we will know more when the Draft EIS & preferred alternative are selected in the Summer, or if a project update is released announcing the eastern alternatives have been eliminated. The March 2019 newsletter that I received from VDOT when I subscripted to them, didn't directly said the eastern alternatives are eliminated, but they made no mention of eastern alternatives. This seems true that all eastern alternatives are eliminated. Because they are going to move along with the field work with potential environment impacts of EACH ALTERNATIVE ADVANCED in the study, which means the alternatives in the updated map is being advanced, thus eliminating the eastern alternatives. I will find out soon as I just emailed them. Hopefully they will respond so I can share the news in here. I would have to disagree. They are not going to drop the original approved alternate that was obviously active 2 months ago, without some kind of explanation. I would say that the webmaster made a mistake. That was fast. I got a response from the one who is in charge for the Route 220 Study. Here is what he told me that pretty much confirms the eastern alternatives are in fact eliminated and put aside. You are correct. 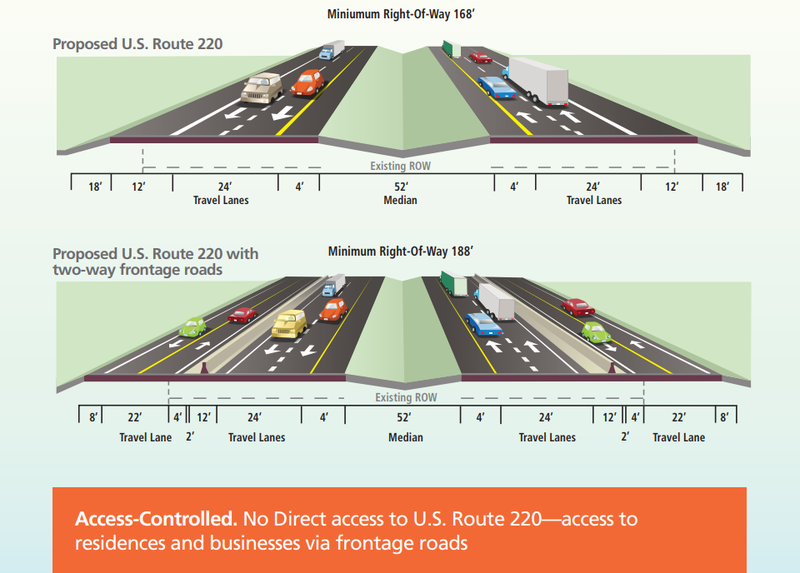 The options that were previously shown east of Route 220 were not retained for detailed study. Those options will be documented and discussed in the Environmental Impact Statement; however, they will not be analyzed in detail and will not be under consideration for identification of a preferred alternative. Thank you for your interest in the study. Did he say WHY? They need to provide a detailed explanation. I am sure this will be explained in a later date. My reply to VDOT -- not a valid response. If you are publishing a major change like this then I want to know upon the publishing. I wouldn't know the exact reason... I'll write an email to the project manager, along with asking about how this will affect the rest of the I-73 corridor. I emailed the project manager asking about specifically why were the eastern alignments disregarded, and how will this impact the I-73 alignment approved in 2012, and what's the plan for I-73 north of here now that the roadway will likely follow a western alignment. I specifically asked if a new EIS would be completed for I-73 north of Martinsville, now that it will stem from the western side as opposed to the eastern side. I will follow-up once I receive a response. My CTB-related post from Feb. 19th said that FHWA identified the project as one that would meet the One Federal Decision (OFD) Executive Order, August 2018. One of the first uses of that process. It has no connection to the approved route north of Martinsville, MSC is its own project. If they select the red route or the green route, it would only add 1 or 2 miles to the previously approved corridor between N.C. and I-81. Today's neo-Interstate highways cater more toward local interests and development, than as compared to the original Interstate system. Adding 1 or 2 miles would not obviate using the approved route north of Martinsville. I am think that if I-73 is going to use MSC (if it comes to this point), I am pretty sure a new EIS will be conducted to connect to the approved one north of Martinsville. Or... they might have to start a whole new study, thus delaying I-73 extension even more... we will never know until we get a response from them. at the mean time, I will wait and see what sprjus4 said once he got a response from the project manager. At this time, eastern alternatives are not being considered. This is just one step a time. Thank you for your interest in the Martinsville Southern Connector Study/Route 220 Environmental Impact Statement (EIS). To your first point on the change in the south end of the study area, there was a brief error on the VDOT web site where an incorrect figure was shown. That has been corrected. Now that we have retained alternatives for detailed study, they will be further engineered and you can expect to see more detail this summer at our next public meeting. You are correct in noting that the eastern alignments that were under consideration were not retained for detailed analysis in the study. This is due to their inability to meet the Purpose and Need for the study. The Purpose and Need sets the goals for the study and also serves as the primary criteria in the alternatives screening process. The first step in this screening was for VDOT, the Federal Highway Administration (FHWA) , the U.S. Army Corps of Engineers (USACE), and the U.S. Environmental Protection Agency (EPA) to agree on which alternatives met the Purpose and Need and should be advanced for detailed study. That agreement occurred earlier this month and we are now focused on the five alternatives retained for analysis. You can find some information on the Purpose and Need in our previous public meeting materials (see link below). More information on how the alternatives were retained will be presented in future newsletters, at our August public meeting, and of course in the Draft EIS which is anticipated to be issued by FHWA in December 2019. With regards to your comments on I-73, I can only speak to what is going on in our current study. While we are fully aware of the proposed I-73 corridor and its proximity to our study area, the current study has an independent Purpose and Need which has resulted in a different array of alternatives being retained for analysis. This current study will result in the Commonwealth Transportation Board (CTB) identifying a preferred alternative, FHWA issuing a Record of Decision to approve the preferred alternative, and USACE issuing a permit for the project. At that point, decision makers will have two approved projects to consider. What they do with those two projects is well beyond the scope of this current effort. Basically, once this environmental study is completed, there will be two options to chose from. The eastern alternatives have been previously studied, and now this study will focus on western alternatives. 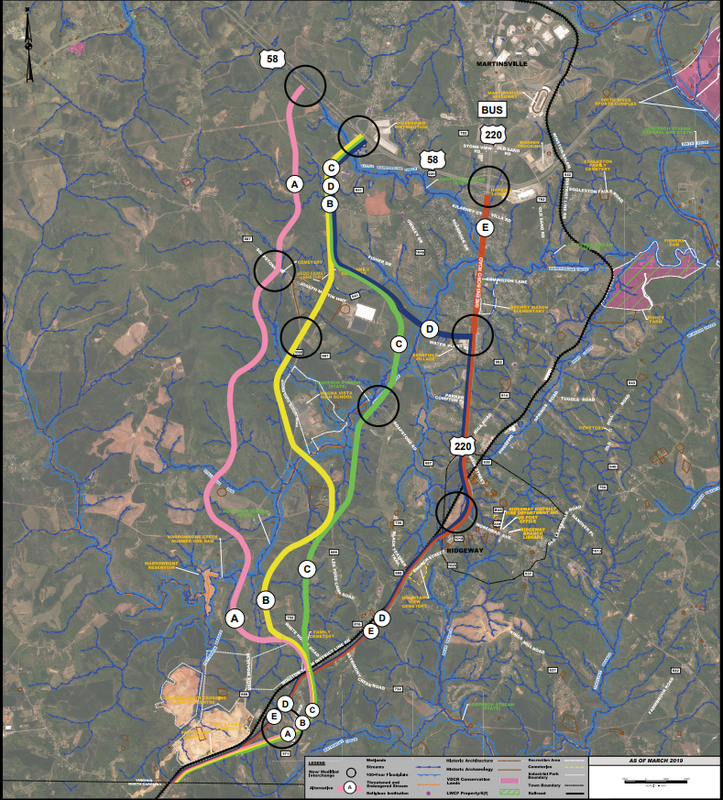 The reason the western alternatives were chosen specifically in this study, because this is focused at creating a freeway connector from the US 220 bypass to North Carolina. US 220 follows the western route, so naturally, so would this. I've said this many times. At that point, "decision makers" will make the final decision on what gets built, either the previous I-73 alignment, or this new western alignment. So technically, the eastern alternative isn't fully eliminated.